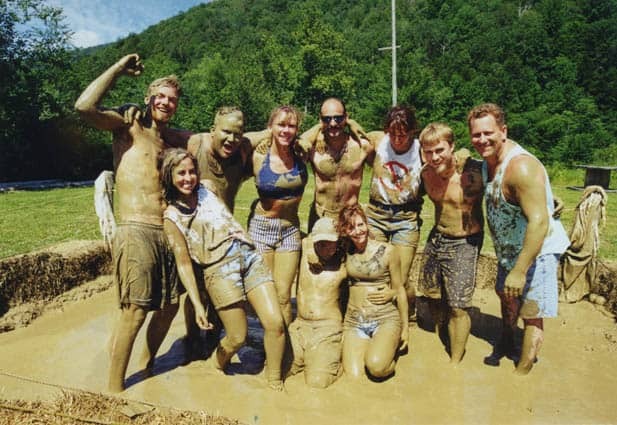 Mud wrestling proved to be a popular summer activity in Killington. This photo was taken a few decades ago and is thought to be from a mud pit at the Pasta Pot on Route 4. Have you ever lived, worked or played in the Killington area? Do you ever wonder what happened to your favorite ski buddies, bartenders or bosses? Killington Resort opened in 1958, 56 years ago. Since that first season, thousands have called Killington their home. Earlier this spring a local group of self-proclaimed Killington “old-timers” began organizing a reunion weekend to bring together once-Killington local. The three-day event will take place June 26-28. “It’s an idea we’ve been tossing around for years,” said Bill Bauer, owner of the Summit Lodge, and and Oke O’Brien, a long-time employee at the Inn at Long Trail. Last year, after they saw many friends reunited at memorial services, they decided it was time to finally launch an annual reunion. All promotions or events for the weekend are welcome, said Bauer. “All activity and energy around that weekend is good,” he said. A videographer will be at the Summit Lodge Thursday and Friday to capture some of the best memories from “back in the good ol’ days” from those who lived it. The event originators hope that area businesses will step up to provide entertainment, activities and/or discounts to entice pervious generations of Killington folk back to the area. With the event right around the corner, partnerships and offerings are beginning to spring up. A welcome reception will be held at the Summit Lodge Friday evening starting at 5 p.m. Saturday, folks plan to head over to the apres-ride party for the Long Trail Century Ride at Long Trail Brewery in Bridgewater Corners. Then on Sunday, Green Mountain National Golf Course is offering a fitting deal: Bring your Killington Ski Pass from the 70s, 80s or 90s to Green Mountain National anytime after 2 p.m. and end the weekend with nine holes of golf, cart included, for just $19.58! Remember the Alpine Inn? For those of you who go way back, Chef Claude’s Choices Restaurant will be offering Alpine Inn menu items Friday and Saturday. Answer the Alpine Inn Trivia questions and get 5 percent off for each correct question! Lodging specials are currently being offered at the Summit Lodge and through the Killington Group, with others expected soon. For more information and/or to get involved, visit the Killington Reunion Weekend page on Facebook: facebook.com/killingtonreunionweekend or contact Bill Bauer at summit@vermontel.net.